Guest Blogger – Gemma Bain, Planet Flowers. We are an event and wedding floral styling company based in Edinburgh and we specialise in enhancing wedding and event venues through the art of floral design. By embracing the venue, the team here at Planet Flowers use colour and texture within our designs to complement not only the venue but the ambience and style of the interiors. It has been our pleasure to provide flowers throughout the UK and further afield for over 40 years. Our flowers come either from our cutting gardens or they’re sent directly from several different suppliers who we have worked with and trust to deliver the most beautiful and highest quality flowers. We have preferred suppliers for individual flowers based on our experience with using many different providers. Of course, within our list of suppliers we are proud to use local, British born flowers too! Should one of our clients desire a flower that is not in season, we are able to use one of our suppliers to source it if we are unable to grow it ourselves. Our own Gemma Bain had white pumpkins for her wedding last year so nearly anything is possible! We are delighted to have been one of the recommended florists at Dundas Castle for over 13 years and in this time we have gained experience in decorating every area of the gorgeous castle. 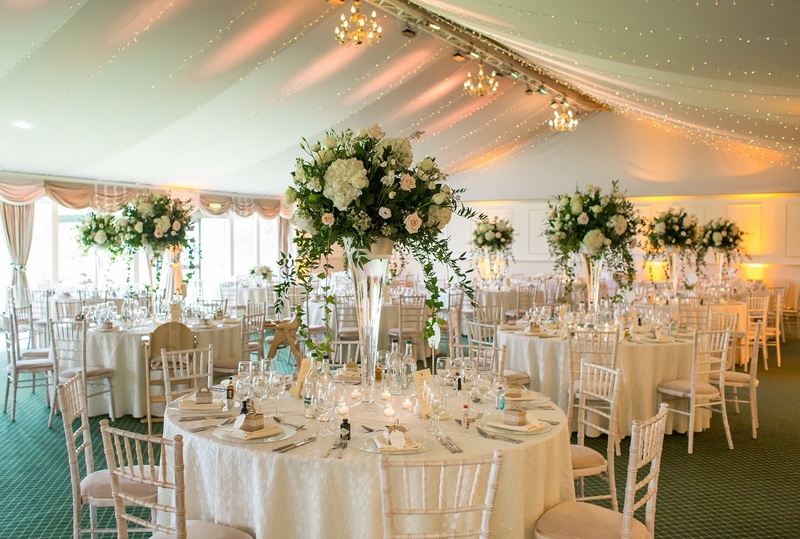 From small intimate weddings in the Auld Keep or Croquet Room to a larger corporate event in the Pavilion, we have styled all the areas in all seasons. We have been asked to do some extravagant, some simple and, of course, some ‘interesting’ designs at Dundas. Whether it’s giving a head-piece to the statue of Sir Oliver Cromwell or hanging yellow calla lily chandeliers in the Pavilion, we have done it all! Some clients want to bring their own personal touch in a big way. We have dressed the Auld Keep head to toe in autumnal leaves, pumpkins and candles and then seven months later, it has been adorned in hot pink and orange! Decorating a winter wedding in candles, fairy lights, crystals and orchids is so romantic and creating a vintage outdoor tea party theme in the summer is fun and exciting. We are passionate about what we do and enjoy exceeding the requirements of our clients. We pride ourselves on not specialising on one style or design but instead suiting our client’s vision. Putting your own personal stamp on your wedding or event and making it yours is most important to us. On the first consult we encourage you to bring as many things that inspire you as possible – material samples, ideas in magazines or from wedding blogs, invitation samples and anything that you can identify with that can help us translate these ideas into something bespoke and uniquely styled for you. If you are unsure of what you want or what will work at Dundas Castle then don’t worry, we can have a good chat and we will always find a design or theme that you will love! We know that Planet Flowers feel as if they are part of the team when they dress an event here. We rely heavily on them to realise our client’s visions and have complete faith in their ability. Having worked at the Castle for many years, Planet Flowers is able to turn even a somewhat uninspiring corner of a room into a feature that guests are sure to photograph! Always current and on trend, while ensuring that their designs are unique, Planet Flowers has never let a client down and we will continue to recommend them for their inspiration and passion. Thank you to one of our recommended suppliers, Rankine Photography for these Photographs, and Ryan White photography for the header image.